By early February 1897 Jimmy had settled his affairs with the National Cycling Union (NCU) and with ‘Choppy’, returning to the States on the 13th via Paris where he visited the Velodrome d’Hiver and arranged for new Gladiator quads to be shipped to America. The match agreed with Starbuck at Jacksonville, Florida, in March was postponed with Jimmy stating that he was unable to get into shape in the time available to him. Instead Jimmy left for California to train under his new manager, Dave Schaefer, while press reports circulated that a match between Albert Champion, the latest young prodigy under the wing of ‘Choppy’ Warburton, had been arranged. Champion was later to establish the Champion Spark Plug Company in Boston, Massachusetts, after a successful career on the track. In February Jimmy signed with the Union team from Boston, thereby ensuring he was eligible to ride in the American championships and compete in the national circuit season. San Francisco was his first point of call where he was due to appear at a three week event at the Mechanics’ Pavilion from 20 March. To Jimmy’s frustration the NCU intervened once again, suspending him for a second time in relation to the case brought against him by the Leeds Cycling and Athletic Club. In response the League of American Wheelmen (LAW), which recognised disciplinary action meted out by the NCU, handed down its own suspension to Jimmy. Having declared his intention to go for all records from 1 to 100 miles Jimmy was no doubt frustrated at being unable to race and the resultant loss of earnings. In the meantime a deal with the makers of Paine’s Celery Compound saw adverts appear in papers across America in which Jimmy endorsed the miracle product “for every bicyclist”. By April the Welsh press were reporting that the fine had been paid and that he expected to be reinstated, further commenting that Jimmy felt that the NCU action was “a case of spite”. Confirmation of the lifting of his suspension by the LAW came in late April leaving Jimmy apparently free to race once again. In yet another twist in the Leeds case the NCU confirmed that the fine had finally been paid on May 22 1897, the implication being that the LAW had lifted its ban in error and Jimmy had been racing illegally in the interim. According to the South Wales Daily Post in June, the American Press had incorrectly reported that the NCU had lifted their suspension, leading the LAW to do the same and then reinstate their ban once the error was realised. April also saw reports that Jimmy had become an American citizen, an action that caused some resentment in the Welsh press. ‘Welsh Athlete’, the sporting columnist for the Evening Express, felt that he “never thought Michael would forsake his country in this way” and called on Tom Linton to bring the championship back to Wales. In the Cambrian ‘Argus’ felt that America’s gain was greater than the loss to Britain, stating that many English riders could beat Jimmy while in “Yankeeland” he was one of the best. As inconvenient as the ban must have been it had no apparent effect on Jimmy’s performance in 1897 when it was finally lifted. In May at Charles River Park, Boston, he “knocked the stuffing” out of the American rider, Eddie McDuffie, in a 15 mile race which Jimmy won in 29 minutes, 12 seconds. In August at Manhattan Beach he defeated Frank Starbuck in a 33 mile paced race, setting American records from 9 to 33 miles and posting a time of 1 hour, six minutes and 14 seconds for the full distance, and finally cracking the much longed for 30 miles within the hour. Back in England J. W. Stocks, whose performances rivalled those of Jimmy and Linton, had set a new world record for the hour of 32 miles, 448 yards in September, also recording 32 miles, 1,086 yards while paced by a motor cycle. 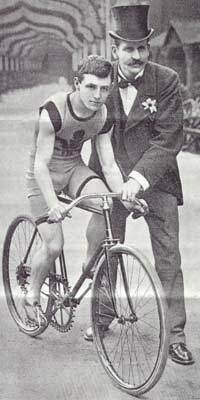 The latter distance was dismissed by the LAW who felt that riders should achieve records solely through their own efforts without the aid of pacing machines, somewhat conveniently ignoring the fact that all Jimmy’s performances had come with the assistance of teams of pacemakers. On October 11 at the Willow Grove track in Philadelphia Jimmy finally gained the coveted hour record, covering 32 miles, 652 yards in 60 minutes of hard riding. Further successes followed, most notable of which were his defeat of Frank Starbuck at Madison Square Garden’s in which Jimmy set an indoor record of 50 minutes and 29 seconds for 25 miles, lapping the American rider to the screams of the crowd, and the ride at the Coliseum, Chicago, where he set new outdoor records for 2 to 12 miles, and 16 to 25 miles. These and other successes saw Jimmy bring home a reported £3,600 in prize winnings for the year, which ended with reports that Dave Schaefer had closed a deal with Phil Dwyer’s stables that would see Jimmy make his debut as a jockey in the Spring of 1898. “News of the wheelmen, The Sun (New York, NY), February 16, 1897, 4. “International cycling,” Evening Express, January 30, 1897, Special edition, 2.; “Welsh cycling star,” Salt Lake Herald (Salt Lake City, Utah), January 14, 1897, 2. “News of the wheelmen,” The Sun (New York, NY), February 16, 1897, 4. “The wheelmen,” San Francisco Call, March 6, 1897, 8. “Cycling notes,” Cambrian, March 12, 1897, 3. “Jimmy Michael suspended,” Evening Star (Washington, D.C.), March 30, 1897, 9. “News of the Wheelmen,” The Sun (New York, NY), March 15, 1897, 8. See for example the San Francisco Call, April 1, 1897, 8, col. 2. Evening Express, April 24, 1897, special ed., 3. “For the bicyclist,” Scranton Tribune (Scranton, PA), April 24, 1897, 3. “Cycling,” Cambrian, June 4, 1897, 7. “Cycling,” South Wales Daily Post, June 30, 1897, extra special ed., 4. “Football poaching,” Evening Express, July 1, 1897, Pink edition, 2. “Cycling notes,” Cambrian, July 2, 1897, 3. “Cycling and athletics,” Evening Express, July 3, 1897, 5th ed., 2. “Cycling: Jimmy Michael creates new records for America,” South Wales Daily Post, August 23, 1897, Extra special ed., 3. “Cycling,” South Wales Daily Post, September 4, 1897, Extra special ed., 2. “Cycling records smashed by Michael,” South Wales Daily Post, September 22, 1897, Extra special ed., 4.; “Marvellous Cycling,” South Wales Daily Post, September 28, 1897, Extra special ed., 3. “Michael will quit racing,” Roanoke Times (Roanake, Va), October 12, 1897, 1. “Cycling,” Carmarthen Weekly Reporter, December 3, 1897, 3. “Welsh Athlete’s general gossip,” Evening Express, December 11, 1897, Extra football ed., 4. This entry was posted on October 15, 2014 by aaroncripps in America, Britain, Cycling, History, People, Wales, Welsh and tagged Cycling, Cyclist, James Michael, Jimmy Michael, Little Jimmy, The Midget Cyclist, Track Cycling, Wales, Welsh History, World Champion.